Transferring merchandise from one store to another is an essential part of successfully running a chain of retail stores. Moving merchandise from a store where it is not selling to a store where there is demand for those items can dramatically increase profitability. On the other hand, transfers also present danger: if you do not have the right controls in place merchandise can be lost or stolen while it is in transit. Fortunately, XpertMart™ gives you the tools you need to effectively control the transfer process. This chapter will explain how to create Out Slips and In Slips . The next chapter will discuss how to run the XpertMatch™ process to automatically detect discrepancies between Out Slips and In Slips and how to make Correction Slips to fix the differences. If you haven't already, be sure you read the Transactions topic before reading this chapter to learn the basics behind making a transaction. This chapter will only discuss the parts of the transaction screen that are uinque to Slips. This opens up the Out Slips transaction screen, which has all of the standard elements of all of the other transaction screens . 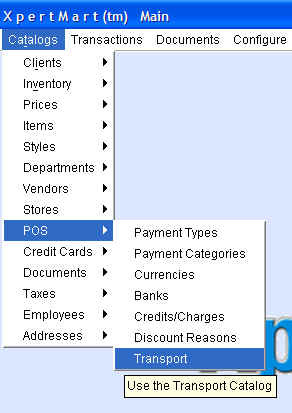 The only difference is that in the transaction header there are three fields unique to Out Slips. This is to close a loophole that could potentially be used for fraud. All Out Slips must identify a store that will receive the merchandise. The third field in the header that is unique to Out Slips is the Transport field. This field is a drop-down menu that contains the entries in the Transport Catalog. The Transport Catalog can be openend by going to Catalogs>POS>Transport. Enter the modes of transport used in store transfers. This will make it easier to track down merchandise that is lost in transit. You can use the Reference field in the Out Slip under Transfers, for example, to enter a tracking number if you are using UPS or Fedex to send the merchandise. Once you've specified the destination store and the mode of transport, you can proceed to enter the merchandise being transferred into the Items Area of the Out Slip. In the example below, 3 pairs of Rosy Black 5.5 Narrow, 1 pair of Zodiacs Raisin 7.0 and 2 pairs of Escalades Red 8.0 are being sent from the Robson store to the Oakridge store. 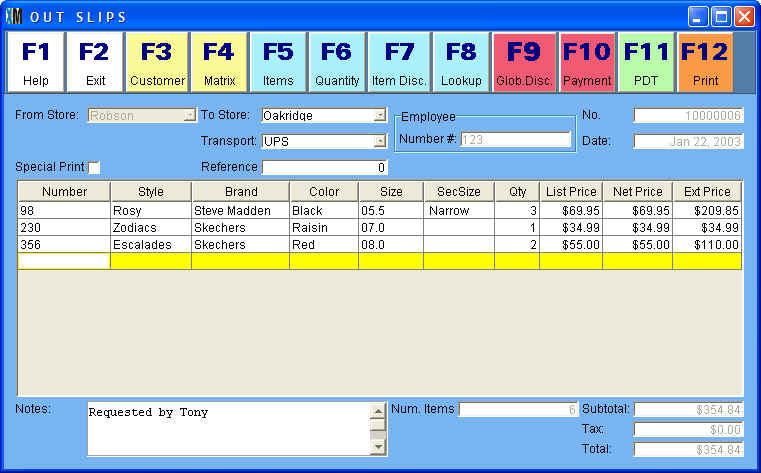 Once you press <F12> those items are subtracted from the inventory of the store sending the merchandise. However, they are not added to the receiving store until that store makes an In Slip. In the meantime, that merchandise is considered in transit- subtracted from the sending store but not yet added to the receiving store. The next chapter explains how to track merchandise in transit. When you have finished an Out Slip and printed, it gets stored in the Documents>Transfers>Out Slips catalog. This is to close a loophole that could potentially be used for fraud. All In Slips must identify the store that is sending the merchandise. While there is no way for the system to know the exact Out Slip number, it can know if the number you enter matches the store you enter in the From Store field, and if the number of digits is too small or too large. You will notice that once the Out Slip number is entered, the system does not populate the Items Area of the In Slip with the merchandise that is in the original Out Slip the way a Receipt gets populated with data on a Purchase Order. This is because maximum control is achieved through "blind" transfers. Ideally the receiving store should not know what merchandise the sending store claims it sent. This reduces the opportunity for theft or fraud. For example, if the sending store creates an Out Slip with 18 items but the receiving store notices that 19 were sent, the employee making the In Slip is free to claim 18 items were received and keep the extra one that was accidentally seen. Therefore, when merchandise is transfered out of the store, the Out Slip that gets printed should show the date, employee and Out Slip number, but should not specify the items being sent. In the example above, the Oakridge store is receiving 2 pairs of Rosy Black 5.5 and one pair of Zodiacs Raisin 7.0. 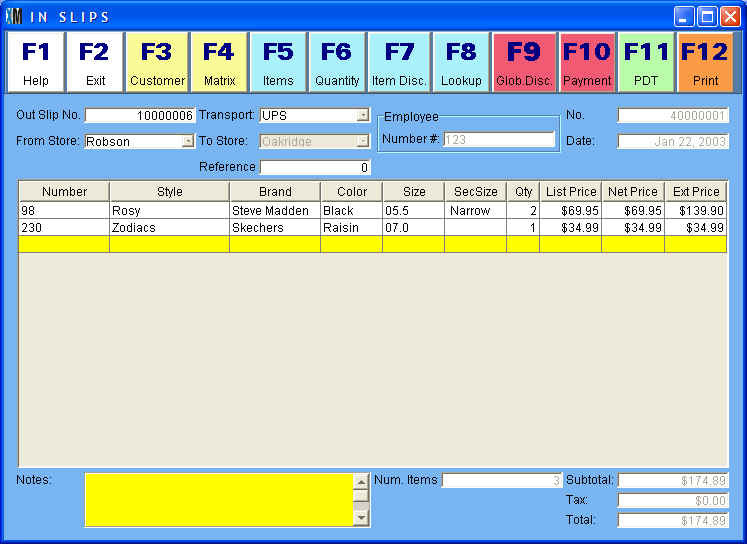 The example intentionally creates a discrepancy between the items sent in the Out Slip above and the items received on this In Slip. In the next chapter we'll see how XpertMart™ handles this discrepancy. 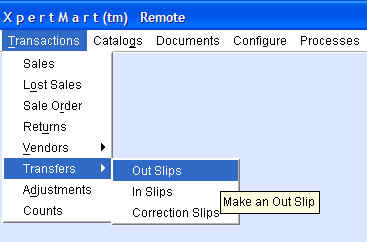 When you have finished an In Slip and printed, it gets stored in the Documents>Transfers>In Slips catalog.